This capital investment model template will help you calculate key valuation metrics of a capital investment including the cash flows, net present value (NPV), internal rate of return (IRR), and payback period. Most companies make long-term investments which require a large amount of capitalCapitalCapital is anything that increases one’s ability to generate value. It can be used to increase value across a wide range of categories such as financial, social, physical, intellectual, etc. In business and economics, the two most common types of capital are financial and human. Examples invested in the initial years, mostly in fixed assetsTypes of AssetsCommon types of assets include: current, non-current, physical, intangible, operating and non-operating. Correctly identifying and classifying the types of assets is critical to the survival of a company, specifically its solvency and risk. An asset is a resource controlled by a company which future economic benefit such as property, machinery, or equipmentPP&E (Property, Plant and Equipment)PP&E (Property, Plant, and Equipment) is one of the core non-current assets found on the balance sheet. PP&E is impacted by Capex, Depreciation and Acquisitions/Dispositions of fixed assets. These assets play a key part in the financial planning and analysis of a company’s operations and future expenditures. Due to the significant amount of cash outflows required, companies would always perform a capital investment analysis to evaluate the profitability of the investment and determine whether it is worthy. This is especially important when a business is presented with multiple potential opportunities and need to make a investment decision based on the long-run returns they can get. 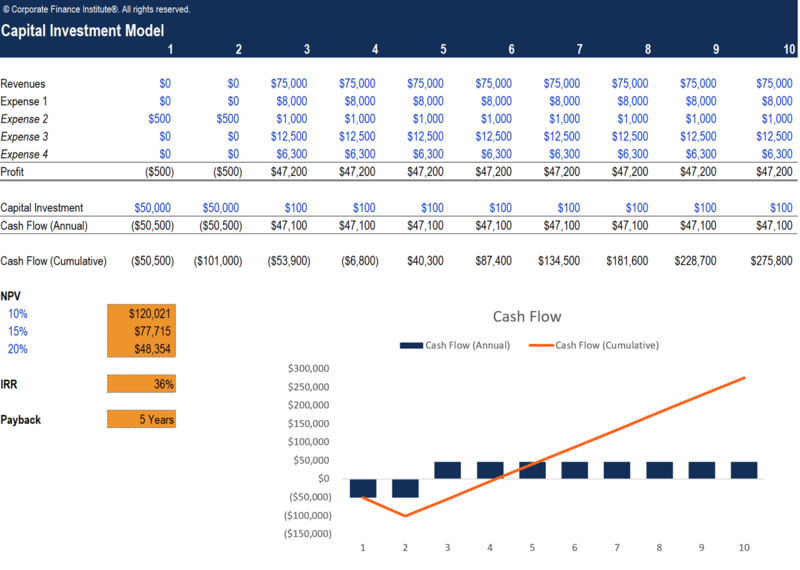 To assess the profitability of a capital investment, companies can build a capital investment model in Excel to determine the cash flows and potential returns. For more resources, check out our business templates library to download numerous free Excel modeling, PowerPoint presentation and Word document templates.